Sherry Raby combined her passion for writing and her love for the circus to create a story that echoes the belief that a wish can change the world. 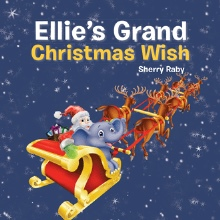 “Ellie’s Grand Christmas Wish” (published by AuthorHouse) describes the fun of a child experiencing Santa Claus for the first time. The book also encompasses the belief that life can change, and wrongs can be righted. The book follows the story of Ellie, a young elephant that lives in the circus, who hears the children talk about Santa Claus and how he grants wishes. Ellie's friends, Tremayne the lion and Obo the elephant, only want to go back home, and Ellie feels that maybe if Santa can come to animals and children, maybe he can grant her friends wishes also. “This book is relevant, because many people are running out of hope, and it is being conveyed to the children. Children need to have something to believe in, and Santa isn't a bad thing. It conveys that people do care about the animals, and the importance of preserving what we have,” says Raby. Christmas is magic. The magic of love. Anything can happen on Christmas. If ever a grand wish should be made, it is at Christmas time.